The KA-MR100G SxS Memory Card Docking Recorder can record HD video in the popular XDCAM EX™ format using a JVC 700 or 200 Series ProHD camcorder. SxS Media Card not included. This compact recorder attaches directly to the GY-HM700, and to the GY-HD200UB or GY-HD250U recorders via the KA-UM100 adapter, and records HD material in the 720P or 1080i* mode onto convenient SxS memory cards. Simultaneous recording to SxS and the camera's internal storage device is also possible allowing you to make instantaneous backup or archival recordings. 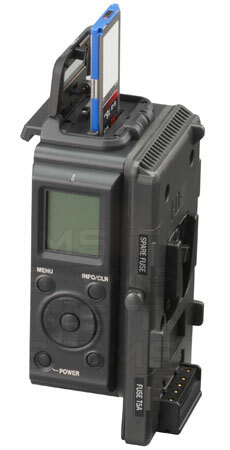 The compact KA-MR100G provides status information on its built-in LCD screen as well as on the camera's viewfinder. Controls and menus are well integrated with the attached camera. 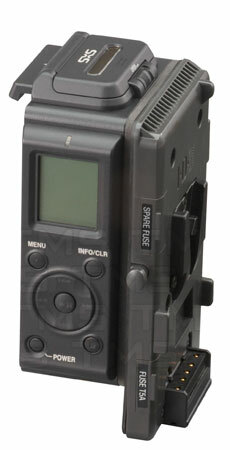 You can even play back recorded video directly on the camera's LCD monitor or viewfinder. Records on standard SxS memory cards. No moving parts! *1080i recording not possible with the GY-HD250. **JVC developed the 720P XDCAM EX™ mode under license from Sony. XDCAM EX™ is a registered trademark of Sony Electronics Inc.